Though originally slated for at least 5 seasons, this short-lived drama explored a world devastated by disaster and plagued with the knowledge of a glimpse into the future. The show started with quite a bang, with agent Mark Benford waking up in the wreckage of his car. Amid multiple flipped cars and people battered, bruised and deceased, he looks out into the distance to see fires, explosions and downed planes in every direction. 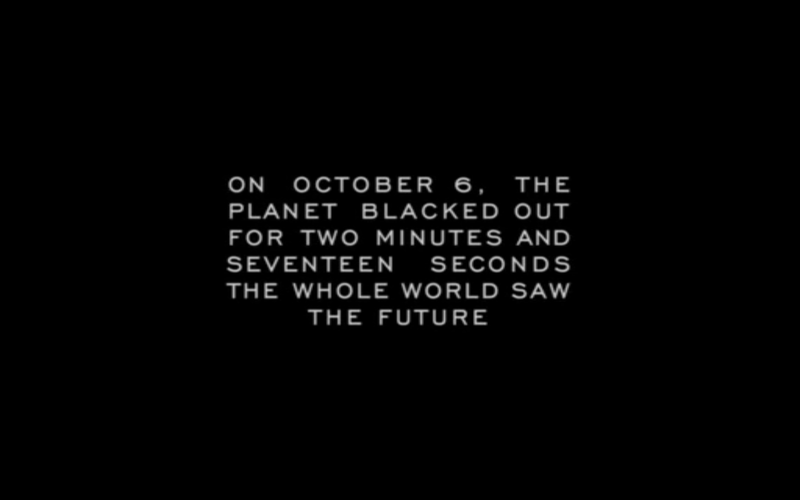 The show spent the start of the series trying to just sift through the wreckage to make sense of what happened on October 6th, but the mystery got deeper as the FBI uncovered more and more evidence of the truth behind the visions experienced during the blackout. Before reflecting on the storylines, here is a quick introduction into the cast. Mark Benford (Joseph Fiennes): As an agent of the FBI, Mark is responsible for heading up the investigation of the blackout. Demitri Noh (John Cho): Demitri serves as Mark’s partner, who is devastated by the lack of a vision during the blackout. Stanford Wedeck (Courtney B. Vance): This director of the LA branch of the FBI is a extremely cautious but holds a number of his own secrets. Dr. Olivia Benford (Sonya Walger): This lead surgeon is also Mark’s wife and scared of meaning of her vision. Their daughter, Charlie (Lennon Wynn), is traumatized by her vision. Charlie Benford (Lennon Wynn): Charlie is young, easily scared and holds vital information to help Mark’s investigation. Janis Hawk (Christine Woods): This FBI agent is shrouded in mystery, but maintains focus on the vision of her pregnancy. Al Gough (Lee Thompson Young): Plagued by his flash forward, Al’s work with the FBI proves vital for both personal and investigatory reasons. Marshall Vogel (Michael Ealy): Although representing the CIA, Vogel participates in a number of the FBI’s missions. Lloyd Simcoe (Jack Davenport): Father to an autistic son, Dylan (Ryan Wynott), Lloyd is directly connected to the cause of the blackout. Simon Campos (Dominic Monaghan): Also connected to the blackout, Simon’s activities seem to be in conflict with both sides of the investigation. Dr. Bryce Varley (Zachary Knighton): At the time of the blackout, he planned on killing himself. His vision saved his life. Nicole Kirby (Peyton List): Always seeking repentance, Nicole is part of the Benford family and close friend of Varley. Aaron Stark (Brian O’Byrne): Originally Mark’s AA sponsor, he is obsessed with the possibility that his daughter survived an attack in Afghanistan. Tracy Stark (Genevieve Padalecki): Presumed dead, Tracy is the lost daughter who appears alive in her father’s vision. Zoey Andata (Gabrielle Union): Fiancee of Demitri, Zoey is fixated on the life the two of them are destined to share. Keiko Arahida (Yuko Takeuchi): Though a software developer by trade, Keiko’s vision forces her to make some significant life changes to find the man of her dreams. Dyson Frost (Michael Massee): Key to the blackout event, Dyson appears to be as dangerous as he is intelligent and calculated. Ted Flosso (Ricky Jay): As a middleman to the villainous plot, Flosso is a man of influence who has a strange relationship with Simon. Lucas Hellinger (Neil Jackson): Involved in the blackout plot, Hellinger seems to be center to the villainous organization planning to activate the blackouts again. When considering the main storylines, there is a great depth to this show. Each storyline requires the merging together of several of the flash forwards, some coming to fruition and others being affected by unforeseen circumstances. Mosaic: Based on Mark’s vision of a case board, the LA branch of the FBI takes on the investigation of the blackout by starting up a website for people to post their visions. Mark’s leads take them to places all over the globe as he slowly reconstructs the board from his vision to hopefully learn about the details of the blackout and the meaning of his vision (which included him drinking in the office while masked gunman close in on his position). Significant leads include a suspect known as D. Gibbons, the death of crows around the world and a video recording of someone awake during the blackout. Mosaic becomes an interest for a number of competing groups, including other government agencies and terrorist groups. The fact that the investigation uncovers the possibility that the blackout has happened in the past unlocks the possibility that it could happen again. Mark’s & Olivia’s Separation: Secondary to the Mosaic plot, Olivia eventually reveals that her flash forward placed her at home in her bedroom with another man in the house. Supported by Charlie’s vision of Dylan claiming that the house is also his, Olivia meets her mystery man, Lloyd. Though Olivia and Mark attempt to avoid Lloyd at all costs, he keeps finding a way back into their lives, as he later becomes a member of the investigation. Demitri’s Non-Vision: When Demitri finally reveals that he did not have a vision, they learn that his death prior to April 29th is a definite possibility. A phone call reveals that he will be murdered on March 15th. While Mark and Demitri attempt to investigate his future murder, all of the pieces of the puzzle fall into place, including the involvement of Mark’s gun, the corroborating stories from other visions and Zoey’s vision of her on a beach (though originally thought to be their wedding, it is actually her mourning of her lost love). Bryce & Keiko: Just before Bryce can pull the trigger of the gun, his vision showed him that a mysterious woman would come into his life and he would be completely happy. As his story continues, Bryce reveals that he has cancer, but not before he learns Japanese and makes an attempt to find Keiko in Tokyo. Though he fails, Keiko ends up traveling to Los Angeles to reinvent herself as she uses her vision to inspire her life change. A budding relationship with Tracy threatens Bryce’s focus on finding Keiko. Jericho & Aaron’s Mission: In his flash forward, he saw his lost daughter on a cot in Afghanistan, who he believed had been killed. When she mysteriously arrives on his doorstep, he believes his prayers have been answered, but she is not the same girl that left for the service. He learns that Tracy witnessed an event in Afghanistan that put her on the radar as a threat to a military company’s activities. When she is kidnapped, Aaron goes on a mission to uncover the truth about Jericho and save his daughter. An Unexpected Child: Although Janis never ruled it out, she was shocked to find herself pregnant in her flash forward for two reasons: she was not interested in men and had not even begun to think about bringing a child into the world. Constantly reflecting on her vision, Janis begins to make herself scarce and becomes overwhelmingly uncomfortable with her role as a triple agent: working with the FBI, secretly sending confidential material to the villains and following the orders of the CIA to work undercover to reveal the truth of the villains’ activities. Dreading Fate: Agent Al Gough is tortured by his flash forward because he learns that he is potentially responsible for the death of a mother of two. While he keeps this fact a secret, his vision also includes him working on a case that possibly could uncover the truth about Demitri’s potential murder. Al also debates the possibility of taking action to prevent his fate, leading to a stunning revelation about the visions. At the same time, Nicole experiences what she believes to be her drowning at the hands of an unknown man in her vision. She uses the experience to try to give back more at the hospital and seek out how to be a better person to avoid God’s wrath. Simon’s Secret: Although Simon claims to have had a vision of assaulting another man, his involvement in the blackout is much deeper than initially identified. Though not understood until just before the infamous April 29th deadline, Simon was actually Suspect Zero and involved with Flosso’s plot to create worldwide chaos. Hidden from the FBI, Simon was forced into the involvement due to his search for his missing sister after the murder of his father. Simon plays both sides of the fence but possibly desires to be good based on his apprehensions to get involved in Flosso’s and Hellinger’s activities. The final episode wraps up all of these storylines to a point, allowing for some of the questions to still be unanswered for possible future seasons. The show was cut short due to low rating, while V was passed on to a second season with only slightly better ratings. Had this series been allowed to continue, there was a lot of potential for finding out the fates of a number of characters, including Mark, who was seemingly trapped in the FBI building at the moment of the second blackout when bombs destroyed the floor containing his office.